Arrange broccolini on the baking sheet and drizzle with 1 tablespoon canola oil. Roast until the edges are caramelized, about 15 minutes. Set aside to cool slightly. Reduce the heat to 400 degrees F.
Place a skillet over medium heat with the remaining tablespoon canola oil. Add the sausage and cook until no pink remains, about 10 minutes. Set aside. In the bowl of a food processor fitted with the blade attachment, combine the broccolini, Parmesan, cashews, lemon zest, lemon juice, sugar, garlic, and red pepper flakes. Blend until smooth then, with the motor running, slowly stream in the olive oil. Season with salt. Line 2 baking sheets with parchment paper. 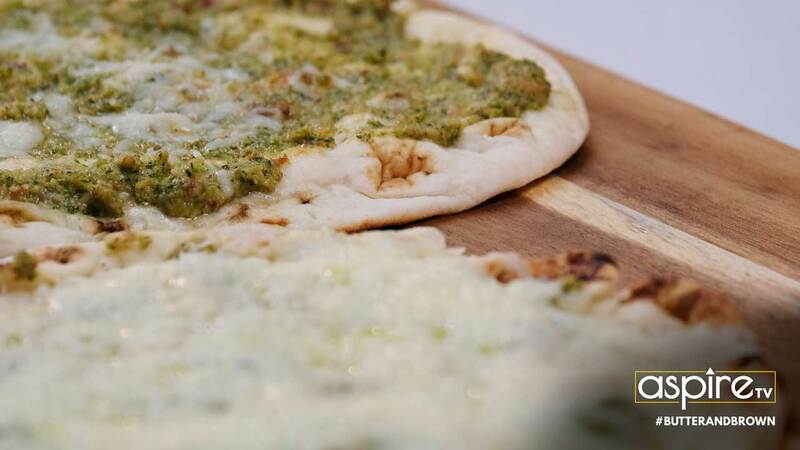 Arrange flatbreads on the baking sheet and top each with a layer of pesto, mozzarella, and sausage. Bake until the cheese is golden brown, about 15 minutes.